Trinity Mirror's £127m deal to buy the Star and Express newspapers could face a government investigation, the Culture Secretary has said. Matt Hancock said he was "minded" to intervene on public interest grounds, including the need to ensure a "plurality of views" in the media. The Competition and Markets Authority (CMA) has already opened its own probe. 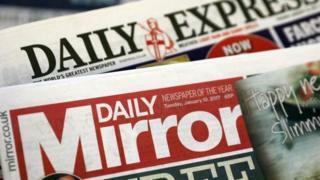 Trinity Mirror agreed to buy the newspapers and magazines such as OK! from Northern & Shell in February. If approved, the deal would mark a major shake-up of Britain's media landscape, bringing together the politically left-leaning Mirror titles, with more right-wing publications such as the Daily Express and the Daily Star. Mr Hancock said Trinity Mirror, recently renamed Reach, stood to hold the largest share of national titles within the UK newspaper market, owning nine out of 20 national titles. He also said it would become the second largest national newspaper organisation in circulation terms, with a 28% share of monthly circulation. "The first public interest ground [for investigating the merger] is the need for free expression of opinion, and concerns the potential impact the transfer of newspapers would have on editorial decision making," Mr Hancock said. "The second ground is the need for a sufficient plurality of views in newspapers, to the extent that it is reasonable or practicable." The merger could lead to cost savings at a time when the newspaper industry faces declining advertising revenues and print sales. However, the CMA has already launched a preliminary investigation into whether the deal would "significantly reduce" competition within the UK media sector. It has until 7 June to decide whether to open a more in-depth competition investigation. Mr Hancock said he would come to a final decision about a separate government inquiry "shortly". Simon Fox, chief executive of Reach, said: "This is a part of the process that we were aware was possible following our acquisition of the Northern & Shell publishing assets. We continue to believe there are no plurality or competition issues. "We would expect any review by Ofcom arising from this Department for Media, Culture and Sport statement [to] happen in parallel with the CMA review, which we expect to conclude by June 7 2018."